Sometimes early morning, just after waking, or shower time yield the best inspiration. With all of yesterday's problems it seemed that integrating the LED and the sensors was not worth the effort. Individual addressable LEDs can be purchased which already have their filtering components installed and addressable LED strips are readily available and feature mounting holes for standard header pins. 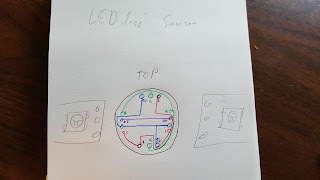 A design for a simple sensor board with feed-through ports was sketched. 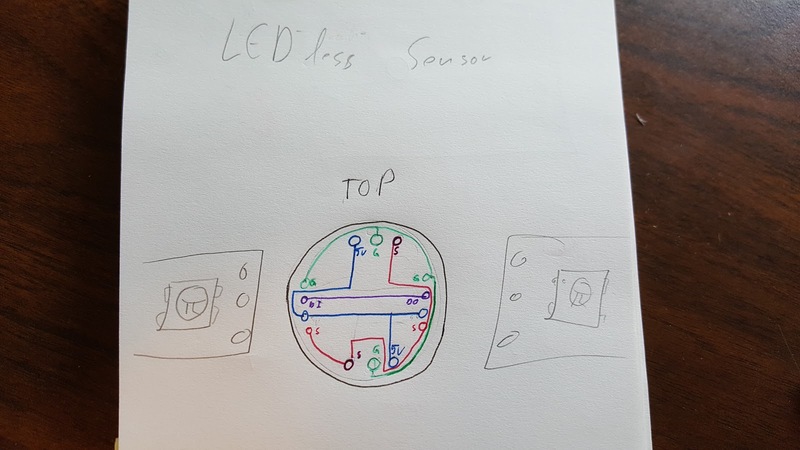 This design would allow a sensor to tap off power from an LED strip and simply send a single wire back to the controller. 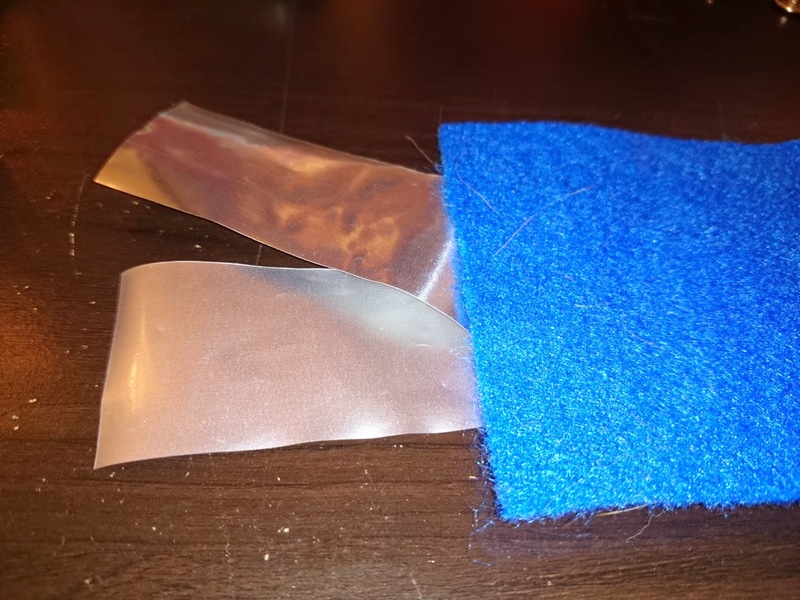 It can go in between two strips, at the end of a strip, at the beginning, or simply take power and have nothing to do with LEDs. 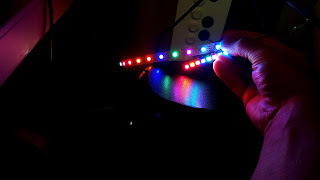 An important test was done with the LEDs to determine if two strips could be run in parallel. 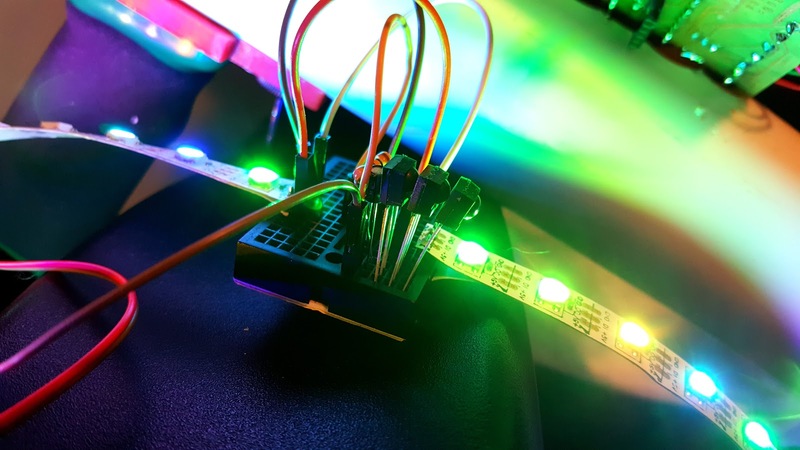 The prediction was that the LEDs would change in parallel but there was a chance they may simply fail to work in that kind of configuration since their data exchange was designed to work in series. An LED strip and a short bar were connected in parallel and given pseudo-random colors. Despite the different spacing of the LEDs, they were the same color in the same order which was the desired outcome. The sensor board and LEDs were combined. 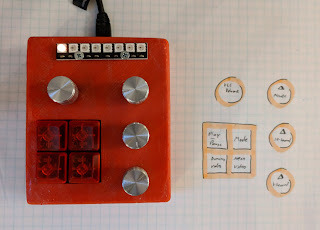 Circuitry for the sensors was on a breadboard. The breadboard also served as a pass-through for the LEDs' power and data while tapping off the power. A single wire from the sensor board was fed to the Arduino and data was easily received from an infrared remote.